Our city. Ready for anything. Though not the natural role of emergency managers, this is not impossible. We at DEM started thinking this way and put our thoughts to paper in September 2009. 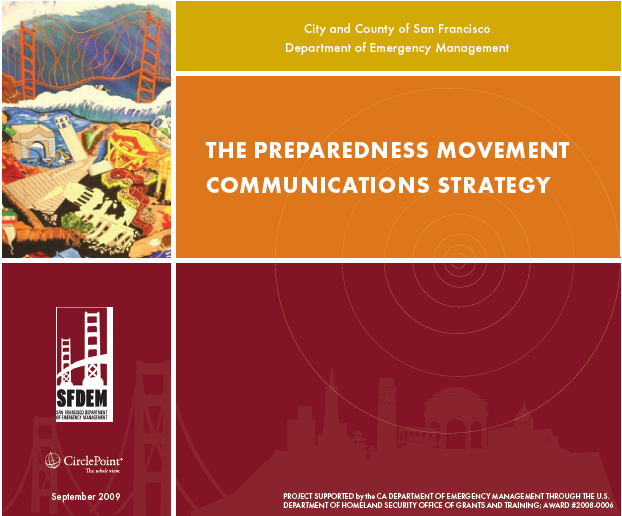 Our strategy entitled the Preparedness Movement Communications Strategy guides all of our preparedness and resilience communications (we hope you will check it out on sfdem.org). We still follow the basics of preparedness messages: make a plan, get a kit, be informed (see our web site: 72hours.org). BUT we don’t start with those messages. That’s more of a third or fourth date topic. First, we have to court the audience into wanting to go out on that first and second date. This distinction is what we call the inspirational message (vegetables make us healthy and strong) versus the instructional message (finish your green beans or no dessert). In San Francisco, we are a prideful, innovative, resourceful, progressive, trail-blazing community. So, that is the cultural value we highlight when talking about preparedness. We connect how being prepared for when bad things happen is celebrating our culture. That we are lucky to live here—and among each other—and that we want to survive, recover and get back to the life we love living here by being prepared. We also want to take the chore out of preparedness (we love to remind folks they are more prepared than they think—because it’s the truth and it makes people feel like they are almost done with their green beans and all the much closer to a bowl of ice cream). That’s the underlying theme we weave in our facebook updates/posts and our tweets; how we ‘act’ when we are at public events; and, who we ‘are’ as emergency managers who, like many, could benefit from a few more brussel sprouts at dinner and have an extra jar of peanut butter in our pantry. At the heart of the matter, we are emergency managers in a local level emergency management department in a high profile, internationally renowned city that is at high risk for earthquakes—and we are the ones responsible for coordinating the response, restoration and recovery of San Francisco when faced with an emergency and/or disaster. That’s a lot of pressure to get San Franciscans to ‘eat their vegetables’. Luckily we have a ton of farmers markets. Who Handles Information During a Disaster? 2016 Dispatcher of the Year!